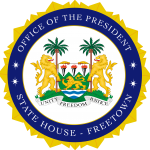 State House, Freetown, Tuesday 18 September 2018 – A delegation consisting members of Parliament from Britain has visited His Excellency President Julius Maada Bio where they commended him on his initial steps since he was elected President in April this year. Head of the delegation, Honourable John Mann, said as lawmakers they were impressed with the astute leadership qualities already shown by President Bio, noting that the new government was on the right path, especially in the area of education and as well expressed optimism for improvement in other sectors. Honourable Mann also congratulated President Bio on his victory in an election he described as democratic and credible, adding that that showed clear signs of how much the country had developed democratically. Mann stated that the British parliament was delighted with the strengthening of cooperation between the British Parliament and its Sierra Leonean counterparts. “We are aware of your free quality education, which is a laudable venture, and we anticipate that there will be development in other sectors as well. We are delighted about your democratic values and how our two parliaments have cooperated. We recognize the significance of democracy here and the close tie between our two countries,” he said. Another member of the delegation, Angela Rayner, MP, also praised President Bio for his leadership style and what he has achieved so far. “We are very impressed and excited to see what you have done,” Angela said. As the UK Opposition Spokesperson for Education, Angela commended President Bio for his vision on free education. On his part, President Bio thanked delegation members for their visit to the country. He said the nature of the present parliament was a strange one but that his government had adapted quickly because of its level of inclusion. He assured of his determination to work with the opposition for the furtherance of the country, noting that the new government was fully committed to peace, democracy and inclusive governance. He disclosed that his government inherited a nearly bankrupt economy which was making the development process very challenging and that he had to institute tough revenue generation drives, one of which was the single treasury account, which he added had been able to help support the government in its priority programmes. “Despite the poor economic climate we inherited, we have been able to start our major programmes through robust revenue generation. As a nation, we want to lay a solid foundation that will enable sustainable development. In doing so, we have figured out education as our flagship programme because we want our citizens to be part of the development process and that is why we are providing free and quality education for our kids,” he said. President Bio also expressed his commitment to economic diversification and to addressing other social challenges. Also, President Bio was very tough on addressing democratic accountability and fighting corruption. He said that corruption was very pervasive and was depriving the ordinary people of basic amenities. President Bio said that he was using the rule of law to hold people to account and nobody will be victimised unduly, adding: “We have to address corruption and I am very committed to doing that”. President Bio reiterated his commitment to the fight against corruption after a certain UK MP has engaged in a series of actions to smear Sierra Leone and the Government.